This workshop will introduce Ircam Spat, a software suite dedicated to real-time sound spatialization and artificial reverberation. The workshop is intended for composers, computer musicians, sound engineers, sound designers, video artists or scientists with interest in spatial sound. Participants are also encouraged to bring their own projects/materials/ideas in order to discuss or build them collectively. Pre-requesite: basic skills on Max/MSP, PureData and digital audio workstations. Teachers: Thibaut Carpentier (Ircam), Rama Gottfried (CNMAT), Jean Bresson (Ircam). • Concepts and overall architecture. • Using Spat in DAWs. • Highlights on Higher-Order Ambisonic: synthesis, capture, decoding, and transformation of sound fields. • Measurement, denoising and analysis of room impulse responses, and their exploitation in convolution or hybrid engines. 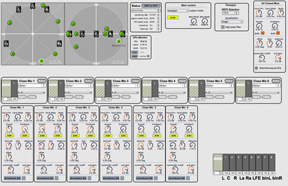 • Introduction to Panoramix, a new mixing and post-production workstation for 3D audio. • Case studies of selected productions. • Linking Spat with digital audio workstations through OSC. • Compositional use of sound spatialization in OpenMusic. • Sneak peek on future releases.